Home / All Things Geek / Alita: Battle Angel-Passport to Iron City is Open Now!! 20th Century Fox and production company iam8bit, collaboration PASSPORT TO IRON CITY is a first-of-its-kind experience, combining custom technology built for the retro-future Alita aesthetic and highly-detailed sets which have been recreated down to the last detail by the film’s award-winning production designers. The result: a life-sized, fully immersive board game where YOU and your team are the game pieces. Now open in Nee York, Los Angeles & Austin. Live like a local in Iron City: join your team for exclusive drinks at the Kansas, the famous hunter-warrior watering hole, and explore the vibrant streets of Iron City, where you’ll interact with the City’s gritty residents and visit familiar landmarks, from the infamous cyborg scrapyards to the high-energy Motorball Stadium. Stroke of Geeky marketing genius. 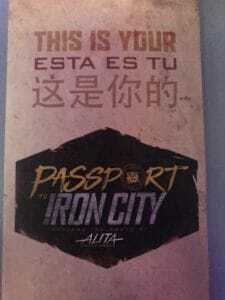 Alita: Battle Angel: Passport to Iron City experience! Part Escape Room Part themed bar all fun! Earn credits by completing puzzles and challenges, experiment with innovative technology, and uncover hidden clues to determine your fate. PASSPORT TO IRON CITY is a robust, multi-faceted 2-hour experience, played in groups of six. You will live like a local in Iron City, drinking exclusive beers at The Kansas Bar, a famous hunter-warrior hangout, while strategizing with your team. Once you have a plan, you’ll be thrust onto the bustling streets of Iron City, where you’ll interact with the City’s gritty residents and explore familiar landmarks, from the infamous cyborg scrapyards to the high-energy Motorball Stadium. Earn credits by completing puzzles and challenges, experiment with innovative technology, and uncover hidden clues to determine your fate with the factory. What if I haven’t seen ALITA: BATTLE ANGEL yet? 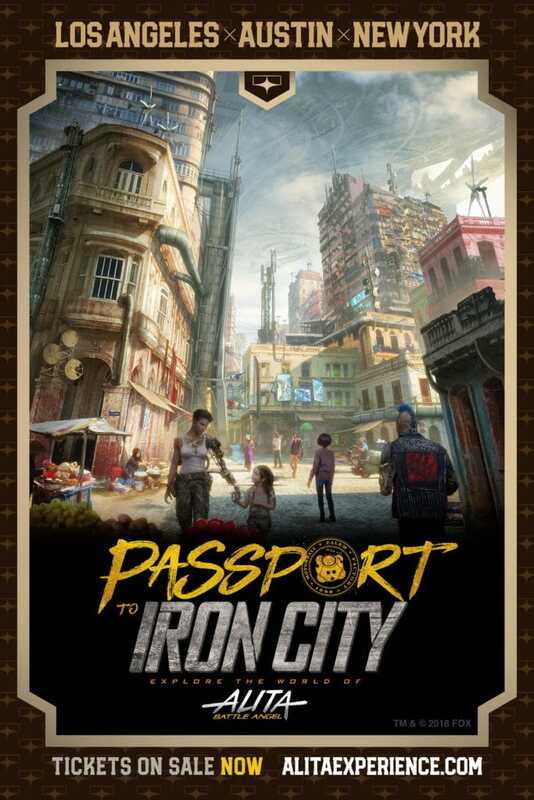 Passport to Iron City is for both existing Alita fans and those who are new to the world of Iron City, so if you haven’t seen the film yet, you can still enjoy the experience – and have a shot at being on the winning team. How long is the experience? When should I arrive? The entire experience is approximately 2-hours long. Check-in begins at your listed ticket entry time, and we encourage you to arrive within 30 minutes after your ticket entry time for the full experience. Check-in will be open until 45-minutes after your ticketed entry time (ie. 5:00-5:45 pm for a 5:00 pm ticket). There will be a security check and all bags are subject to search upon entry. Management reserves the right to refuse entry. You will be checked in, have some time to grab a drink, meet and strategize with your team, and explore Kansas for clues that may just give you an advantage! After that, you will be invited into the Iron City game room, where you will have approximately 45 minutes to complete challenges to earn the most credits. What happens if I arrive late to my time slot? If you arrive after the check-in for your ticketed time slot closes, you will not be allowed into that session. There will be no late entry. Tickets cannot be refunded or rescheduled. What is the age recommendation for children? All visitors 13 & under must be accompanied by an adult. We advise families with children under 13 to attend sessions that start before 6 pm. We advise all guests to come in comfortable clothes and shoes. Expect to be on your feet and active for the duration of the experience. Will there be drinks at the experience? Each location will feature an exclusive craft beer from Three Weavers Brewing, specially designed for each city and themed around the world of Alita: Battle Angel, along with Underwood wine from Union Wine Company. No outside food or beverages will be allowed. Please note that our beer and wine permit in New York City is pending. Can I take photos at the experience? Yes, photos will be allowed in the Kansas and after the experience, but you’ll be asked to turn your phone off in the game room. Please use #AlitaExperience when posting on social media. Are the venues ADA accessible? 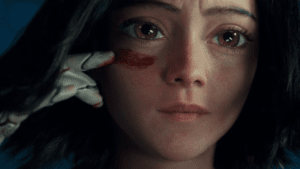 When is ALITA: BATTLE ANGEL in theaters? ALITA: BATTLE ANGEL opens on February 14, 2019. Can I reserve group tickets? 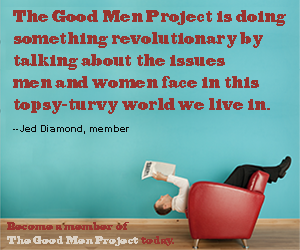 You can buy any available tickets on our website for groups of up to six. If your group is larger than 6, please purchase multiple orders to obtain the tickets you need. I’ll be checking it out and let you know my thoughts on this amazing interactive movie experience soon!